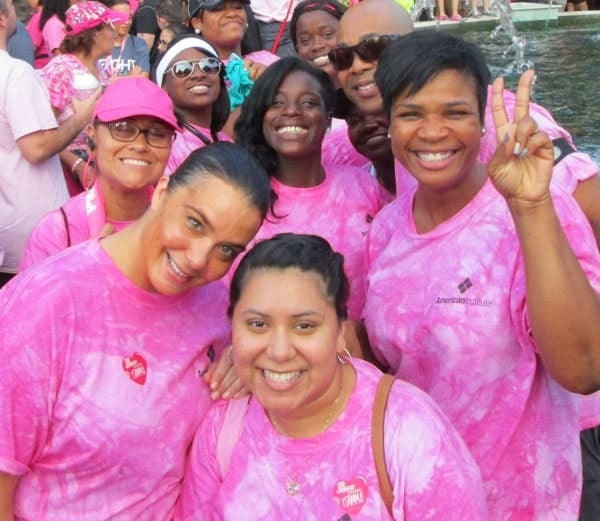 October 2015, Margate, Toms River, and Clifton – This October, American Institute students and staff spent the month fundraising to support the fight against Breast Cancer. One in eight women will be diagnosed with Breast Cancer in their lifetime according to The National Breast Cancer Foundation, and many of the American Institute family have been personally impacted by the disease and are passionate about supporting this cause. Margate students and staff held a ‘Pizza Day’ fundraiser along with asking clients at the Student Salon for donations after their services. The Margate and Toms River teams also walked in their local Making Strides Against Cancer Walks to show their support. Team Clifton held a Go Pink day on campus to raise funds where students and staff donated to wear pink instead uniforms or business attire. Together, we were able to raise over $600 in donations for the American Cancer Society to help in the fight against breast cancer.